Back in September I pick up two magazines, Paper Crafts and Card Maker. I’m just getting around to playing with some of the cards now. Boy were has this month and last month gone? This card is from Paper Crafts and I just love it. 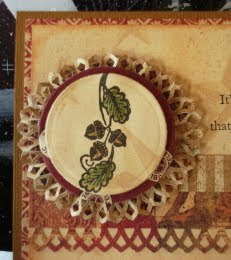 Beautiful papers from Graphic 45 and stamp on the front is from Stampin’ Up and The Paper Company. The punch is from Martha Steward. Have a great day stamping. 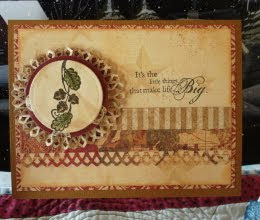 Labels: Card Maker Magazine, Graphic 45., Paper Crafts., Stampin'Up. Wow, this is gorgeous, Vada, and the inside is a delight to match the beautiful outside! Vada, you always amaze me with your beautiful cards. Love this! Gorgeous card, Vada! 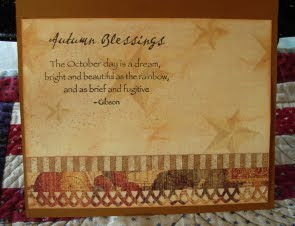 I love those harvest colors and your borders are so very pretty! Gorgeous Vada! gosh lots of catching up to do. I've missed out on so much this month, glad to be back and Lovin your art! This is absolutely beautiful, love it!